You don’t have to preserve everything! Eat some now, and it doesn’t get any easier than this tomato salad. 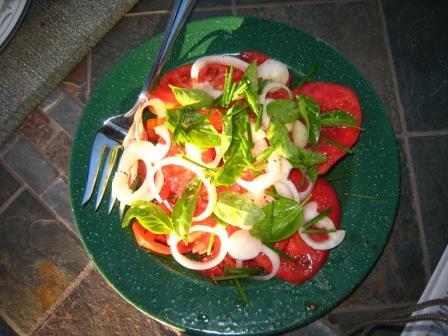 In fact, the gardener made this salad all by himself. Slice tomatoes onto a plate. Sprinkle with fresh basil or chives. Add sliced onions. We like sweet onions such as the Vidalia or Maui Maui, but green onions (scallions) or no onions will also work. Drizzle with olive oil and Balsamic vinegar. Chill and serve.